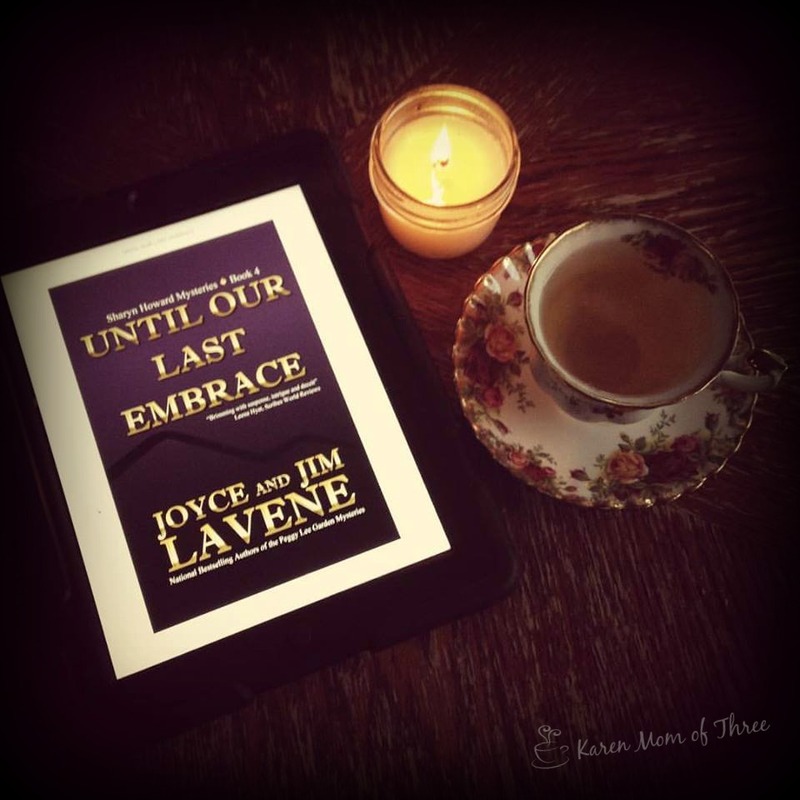 A Cup Of Tea and A Cozy Mystery: Until Our Last Embrace By Joyce and Jim Lavene, Book 4 in the Sharyn Howard Series! Until Our Last Embrace By Joyce and Jim Lavene, Book 4 in the Sharyn Howard Series! Tuesday I read and loved Until Our Last Embrace by Joyce and Jim Lavene, this book 4 in the series was very well written and flowed perfectly. I love the strong believable characters, the complex relationships between main character Sharyn and hers staff and family. This one was one of my most favorites in this series. This was a strong mystery and I love how the connections to the mystery are all tied in to the previous books in the series. Sharyn is the third generation of Howards to be elected sheriff in the small town of Diamond Springs, North Carolina. She has her hands full when word of a bear attack throws the town in a tizzy, especially when a reporter prints a false story claiming that the bear was rabid. The victim was Darva Richmond, the sister-in-law to Beau Richmond, a man previously murdered. Her husband was suing his brother's widow over a large inheritance. While the mauling is tragic, no one initially suspects foul play until officers look beyond initial evidence. As clues are revealed, Darva's husband seems to be the logic suspect. But his bitter family also provides is also suspicious. Further, Darva's aunt, Miss Eleanore, arrives in town with her accusations. Contradictory reports of Darva's marriage add to the confusion as friends report that Darva and husband Donald were the perfect couple, yet family claims that they were always fighting and didn't sleep together. Donald was contesting his brother's will because it was changed during the last few months of Beau Richmond's life. Donald says he brother was stable enough to make out a new will that changed his heir from being his brother to being his new wife. Millions are at stake. In addition to a touchy investigation, Sharyn finds herself confronting a host of other problems. District Attorney Jack Winter is determined to express his romantic interest and doesn't hesitate to use political machinations for his own purposes. 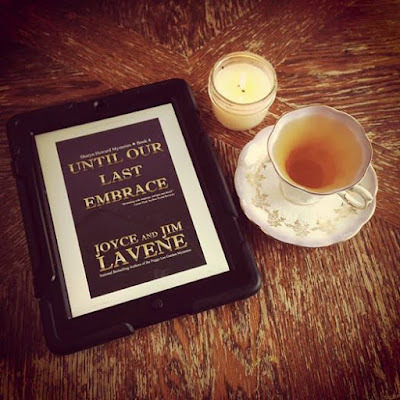 She also must find a date to attend her mother's engagement party, although her mother's marrying Senator Caison Talbot, a man Sharyn neither likes nor trusts. Her deputies seem to be fighting affairs of the heart that leave her short staffed. Further, because she doesn't see herself or her job as desirable, she's clueless in realizing her medical examiner is interested. To top it off, the dry cleaners dyed her uniforms blue. 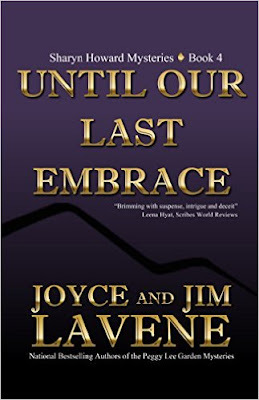 To order your own copy of Until Our Last Embrace by Joyce and Jim Lavene please click here. I enjoyed this book as well. Kind of bittersweet. Sounds like it's not over, so that's good news! I want to read this series. Thanks for your post.